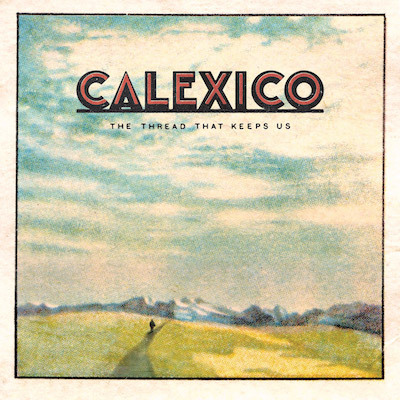 When Calexico released Edge of the Sun in 2015, it was received with open arms and considered a welcome return to form following the diversion the Arizona band took on their somber predecessor Algiers. Three years later, following a relocation to Northern California, John Convertino and Joey Burns have boarded The Phantom Ship (their new studio) with a crew of the finest musicians and a trove of fresh inspiration. The Thread That Keeps Us sets the tone from the offset and the theme echoed throughout resonates on lead single ‘The End of the World With You’. Stating, “Love in the age of the extremes”, acting as the axis that Thread… pivots upon, as it explores hope and fear during tumultuous times. Similar to garage-rock whizz kid Ty Segall on his latest outing Freedom’s Goblin, Calexico’s ninth record is a celebration of musical diversity, from a prolific band that never shy from experimentation. “Whenever we’re writing and we come up with something that sounds too familiar, we say let’s keep going and see what else we can uncover.” says Burns. Delving into folk, Phil Spector-esque pop, mariachi, disco, easy listening and outright rock n roll, Thread… is a successful showcase of stylistic versatility, without becoming disjointed or diluted. ‘The Town and Miss Lorraine’ could’ve been written whilst gazing at the albums artwork; an infinite landscape of fields, mountains and clear skies, depicting easier times and a feeling of hope and safety. The meandering nature of the record is anchored by interluding instrumental tracks that bridge the sonic transitions. ‘Another Space’ is a full on dance floor filler, yet is followed by the short earthy interlude of ‘Unconditional Waltz’, and as it seamlessly drifts into ‘Girl in the Forest’ it doesn’t seem unnatural or out of context. The latter, a stirring example of how fresh surroundings invite progress, and put the state of the planet at the forefront, “being up there on the mountain and taking walks on the shore, swimming in the cold water, we couldn’t help but be inspired by nature. Our love of our earth, our home, and the future of our children came into focus” says Convertino. Burns even cites his own daughter as the real inspiration of the track, admitting “that song would never have been written had I not been sitting next to my daughter… I was leading with this idea about environmentalism and protesters in the forest and I thought there could be some spirit who appears, and then she told me maybe it’s just a girl who’s friends with all the animals.” Carrying a heart warming sentiment of maybe it just is what it is, from a place of innocence found in a child and a reminder to not overthink.